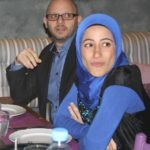 The interfaith families network gathers couples from different religious backgrounds and represents a space for sharing experiences in relation to the couple and family life and its values, as well as for experiencing and building interfaith solidarity and interreligious relations with the group and its social environment. The members meet on monthly basis for sharing and reflection meetings, with other social and training activities. The family life values represent the core subject of the meetings and reflection. They are studied based on the personal experience and also on the spiritual teaching from biblical and coranic texts. As part of Adyan community, the members of the families network provide also, on volunteering basis, support to Adyan in its different projects, especially the organization of the Spiritual Solidarity Day. The Network was founded in 2014 and has 11 couples as members. We feel so grateful we had the opportunity to be part of Adyan family. The experience had been very enriching and spiritual; the friendship we gained, the insight we felt and the care we touched were priceless.